I bought this AC partly due to its higher energy efficiency rating. However, my old window AC worked better, although the old one had a lower energy efficiency rating, a lower BTU rating, and the same wattage rating. By this, I mean portable AC does not cool the air as effectively as the window mount AC. If you can somehow install a window mount type AC unit, don't buy this. 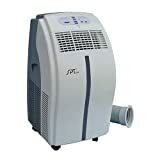 This AC is probably useful for spaces wherein a window AC cannot be used, such as basement, attic, photographic darkrooms, etc. Even then, buy a unit that uses comparable electric power to the window model; don't trust the BTU rating on these portable models. They may be a result of the trick of the measurement condition. One good thing about this unit is that it keeps replacing a portion of the room air, so that the room air does not get the smell of the air conditioned room, even during a continuous operation of the AC. However, you could probably do this manually with a window type AC, if you open the window a few times a day. 1. It isn't very good at drying the air; evaporation is needed for effective air-conditioning (whether in your car or your home). 2. It must be drained of the water it does pull from the air, and draining the unit is very cumbersome. It comes with a small flexible plastic tube that has to be connected to the rear bottom of the unit; the other end must be lower in order to drain or the unit really does very little and although there's an indicator light that will come on if the unit is quite full of water, it's very rare that the light comes on (and it only does so LONG after the unit has stopped cooling the air). We have taken to wrapping a large towel around the far end of the tube to collect water that drains, but basically you must tilt the heavy unit backwards to try to drain it. This is not particularly effective but it must be done. 3. It has wheels, but it doesn't roll easily (it's hard to push or pull it in a straight line and the wheels are so small even getting over a low rug is difficult. 4. Moving the unit up or down a single step can be accomplished by one person but since the entire unit is made of very smooth, slippery plastic (it has handles but they're very shallow & not helpful), it's more safely accomplished with two people. 5. Consider that this unit, while mobile, sacrifices a good window seal. The large exhaust hose (which pumps the hot air outside) resembles a telescoping dryer hose that easily falls out of the backside of the unit and is awkward to extend evenly. The unit comes with a smallish piece of foam with a cutout hole for the hose. However, you are left with having to find some way to block the rest of whatever window you choose to put the hole into. We use a large carboard box panel and cut a hole out of, then duct-tape the box into the window opening to block out air seepage. As you can imagine, it looks pretty tacky. This is not my 1st portable however this is my first combo heater and air conditioner. Compared to previous experience, this unit has a loud fan! Max. Plate rating is 6A @ 120VAC. I while have not put a watt-meter on it, and doubt it goes beyond 5A. I think the 10,000 BTU rating is a little generous. As required by US Federal law, it has a GFI on the end of the cord. This can be an issue in dry climates as the ground can literally dry out! The air filter is typical, which is to say stock cheap and cheesy. Spraying with something like endust helps.